Explore and taste the depths of Lao cuisine with Lao-Australian food blogger, Ngeun of Padaek.com! Vastly undiscovered, Lao cuisine is often likened to its better known Thai counterpart. However, like every culture, there are big differences to be discovered and appreciated! During this tour, you will explore the depths of Lao cuisine, with its fresh ingredients and exotic flavours. We’ll be sharing with you some of the most interesting Lao dishes, such as sai oua (grilled pork sausages), the national dish of Laos – larb (minced meat salad), desserts including khao neow mark muang (sticky rice and mango), and of course the staple food of Laos – khao neow (sticky rice). 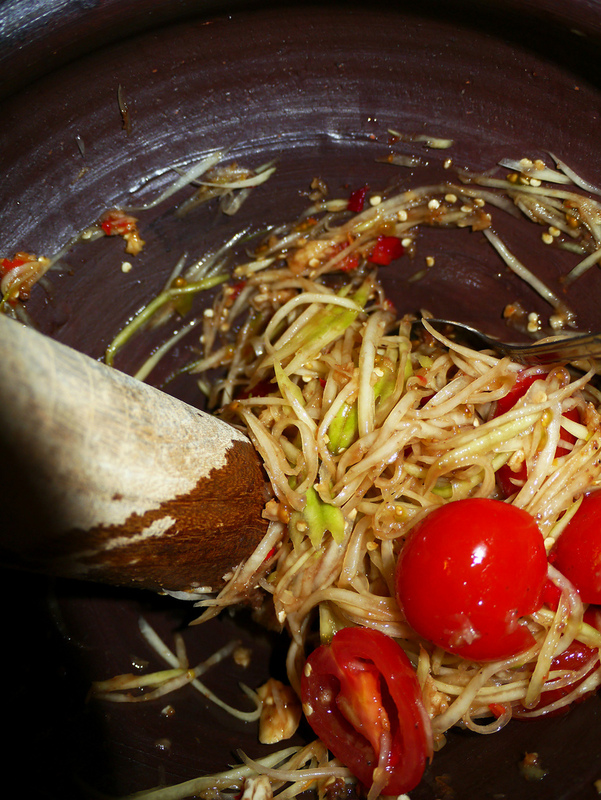 You’ll even get hands-on in a cooking class and make your own tam maak hoong (Lao green papaya salad). Please contact us with your desired dates to check availability. This event is available as a private/corporate experience for groups of 10 – 30 people. Please note this is a guided walking tour and no transportation is provided. The I Ate My Way Through Laos in Sydney tour meeting spot is at the corner of George Street and Campbell Street, Haymarket, Sydney. It is a short seven minute walk from Town Hall Station, or a ten minute walk from Central Station. $90 per person (inc GST) which is all inclusive of a hands-on cooking class, a sumptuous banquet, a personal tour guide, a boutique grocery bag and tour notes. Please allow approximately four hours for this tour.